As a part of our catch up of the conference action, it’s now time to recap from this past weekend where we finally had ideal spring conditions for each of our competition locations. The weather more than likely influenced how much the conference listings changed – from a quick count, there are easily over 100 changes to the top 10 listings across all of the events listed on TFRRS. This week, we have a different format of these recaps. If you wish for more detail, we provided links to each of the recaps provided by schools’ athletic websites. Harvard and Yale held their annual rivalry dual meet this past Saturday in New Haven, CT, where the Crimson women won for the ninth straight year while the Bulldog men broke the Crimson’s five year winning streak. Harvard’s Nikki Okwelogu (shot put, discus) and Paige Kouba (1500m, 800m) both won two individual events, on top of Harvard getting point scoring sweeps in 4 events, to help their team to the win in the women’s competition, 95 to 58. In the men’s competition, Paedyn Gomes (110m hurdles, 400m hurdles) and Marc-Andre Alexandre (200m, 400m) both claimed two individual events and part of the winning 4×100 relay to help the Bulldogs edge out the Crimson by 3 points, 83 to 80. Princeton hosted their second home meet of the season from Thursday to Saturday, which included full heptathlon and decathlon competitions. The Tigers won both scoring competitions by over 100 point margins. Indoor Heps Track MVP Carrington Akosa won both the 100m and 200m events with wind-legal new personal bests that either tops the conference (10.67) or sits as the fastest wind-legal performance (21.36). Adam Kelly continues to improve in the hammer throw, adding almost a foot to his personal best to win the event with 218-05 which ranks him #6 in Ivy League history. Allison Harris also continues to improve in the pole vault, as she cleared 13-05 ¼ to win the event and sit as the #3 performer in Ivy League history. Cornell and Dartmouth had some of their men participate in the decathlon, where Austin Jamerson won with 6,987 points and Nico Robinson was second with 6,866 points. There was a small Ivy contingent out at the Mt Sac Relays – so small in fact that not all of the schools have a recap of their performances. 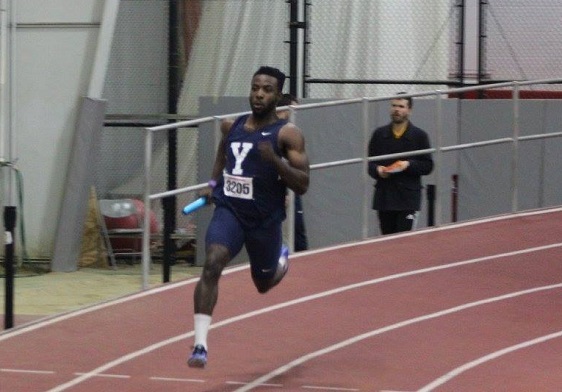 Kevin Dooney of Yale was the lone Ivy undergraduate representative on the track. He ran the elite 10km, where he finished 28th overall in 29:39.36. In the field events, Princeton sent their two pole vaulters, Adam Bragg and August Kiles. Bragg tied his seasonal best height of 18-00 1/2 to finish third in the elite pole vault field and top collegian. Kiles was in the open pole vault event where he cleared 17-00 3/4, which was good enough for fifth overall. Cornell headed to Lewisburg, PA for the Bison Outdoor Classic at Bucknell University. The Big Red won a total of 10 events and had five performances that top the conference. Rudy Winkler set a new personal best in the hammer throw of 237-05 to win his season debut. The distance is a new best by 7 feet and moves him into the #2 hammer thrower in Ivy League history. James Gowans (1500m), David Taylor (10km), and Wynndham Curtis (400m hurdles) set new conference leading marks as they either won or finished as the runner up in their respective events, while Udeme Akpaete was involved in three events wins – the 400m, 4×100, and 4×400 relays. Her 400m time tops the conference. Brown co-hosted the Ocean State Invitational with Providence College on Saturday, where Columbia made the trek up from the Bronx to participate. The highlight for the Brown Bears was their 1-2 finish in the men’s 800m, where Ned Willig and Zach Emrich both ran new personal bests and the #2 and #3 fastest times in the conference so far this season. For the Columbia Lions, Iris Chijioke grabbed an individual win in the 100m hurdles with the 5th fastest time of the season and ran the opening leg on the victorious 4×100 relay with Jaycee Parker, Akua Obeng-Akrofi, and Ashley Cunningham. Dartmouth hosted their first home meet in three years on Saturday with the Dartmouth Outdoor Classic. The Big Green easily won both team competitions. Lucas Ribeiro was the lone double winner for the men as he won the discus and shot put. The Big Green women won all of the sprinting events shorter than and including the 800m – including both hurdles and relays – which propelled them to their team win. Penn traveled to nearby Chester, PA for the Chester Quarry Classic where the teams won a total of 11 events. Chris Hatler’s 1500m win highlighted the men’s meet as the time ranks him 2nd in the conference listings. For the women, Kylene Cochrane led a 1-2-3-4 sweep in the women’s 5km race, with Cochrane’s winning time being a new personal best and ranking her 8th in the conference. This entry was posted on Tuesday, April 19th, 2016 at 1:15 pm. It is filed under Athletes, Spotlight. You can follow any responses to this entry through the RSS 2.0 feed.